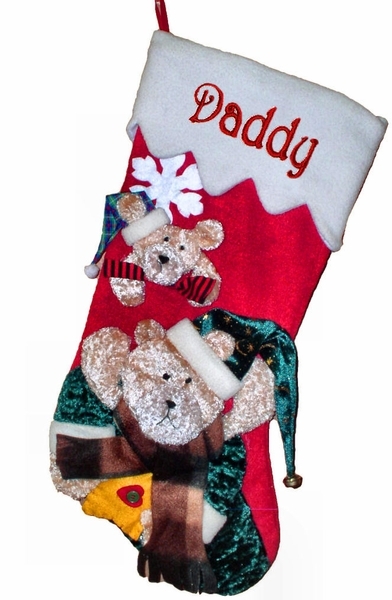 Large 3D Teddy Bear Christmas stocking - adorable, well made, soft, lined, happy... what else... nice and large to fit lots of stocking suffers. Measurements: This Christmas stocking measures 20" diagonally from the stocking hanger loop to the toe. The top opening is 8.5" wide. Personalized on the cuff of the stocking. Names can be embroidered in GOLD, RED OR Green Embroidery thread. For embroidery we have two font styles available: Embroidery Script and Embroidery Block. You can preview the sample of the fonts right here.